Deciding you want to work from home is the easy part. I mean, who wouldn’t want to kill their commute, saving an average of 50 minutes a day? Oh, and then there’s the ability to work in yoga pants. And money saved on gas. And the general happiness that comes with working remotely. But actually finding a work from home job isn’t as easy. For starters, you’ve got to worry about scams. Then you’ve got to beat out the heavy competition. And don’t forget about making your resume sound remote-friendly. No wonder looking for a job IS a full-time job. But, thankfully, there are some pretty useful tricks of the trade that can streamline your job search, giving you more time to apply (and land the job!). If you follow popular work from home bloggers, you’ll notice a lot of the same job leads shared across multiple blogs. Why? Because most of us (myself included) scout the same sites for leads. One of the most popular of which is Indeed. As a job search engine, Indeed crawls the web for jobs and lists them all together (conveniently) in one spot. And it happens to be one of my most favorite sources of home-based and freelance listings. You can seriously find dozens and dozens of remote and freelance jobs here ranging from one-off gigs to full-time careers with benefits. If Indeed isn’t in your work-from-home job search arsenal, you’re seriously missing out. Go ahead and give it a try. 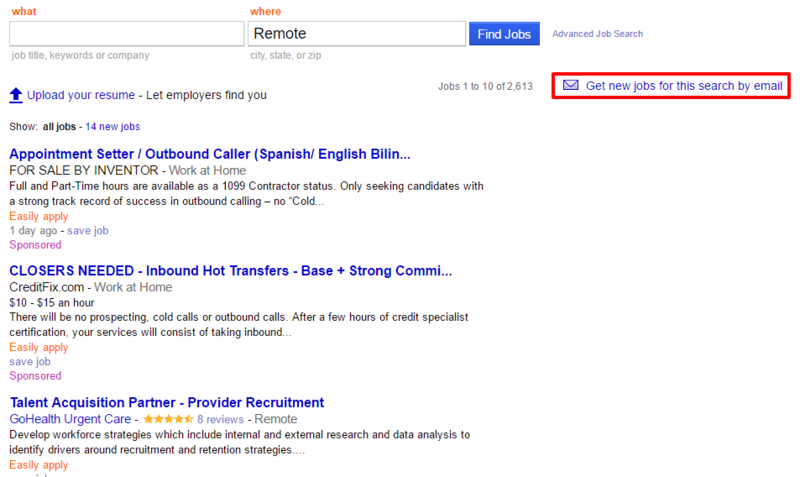 Just type “remote” in the “where” box below and hit the “find jobs” button. 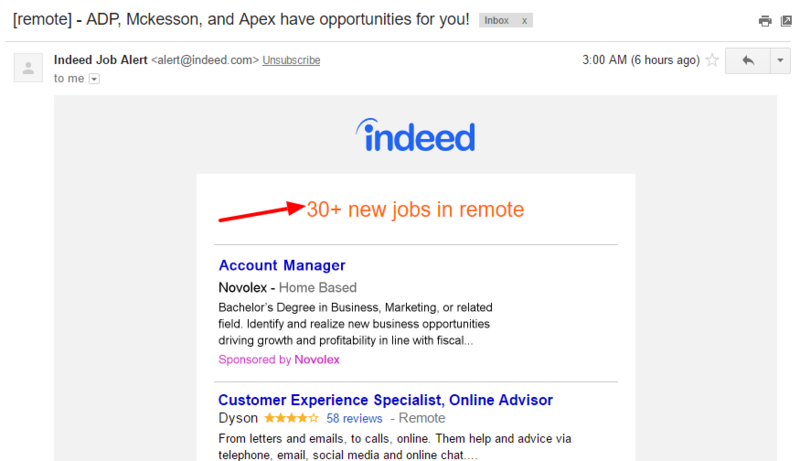 You can make it a habit of checking Indeed mutliple times of day for the latest leads OR you can automate your job search by signing up for alerts. That’s it. Once a day, you’ll receive a digest of the latest remote leads directly to your inbox. On average, that amounts to 30+ each day. You can do this for as many different searches you’d like — so if you’re looking for freelance writing gigs, no problem. Or if customer service is more your thing, that works too. 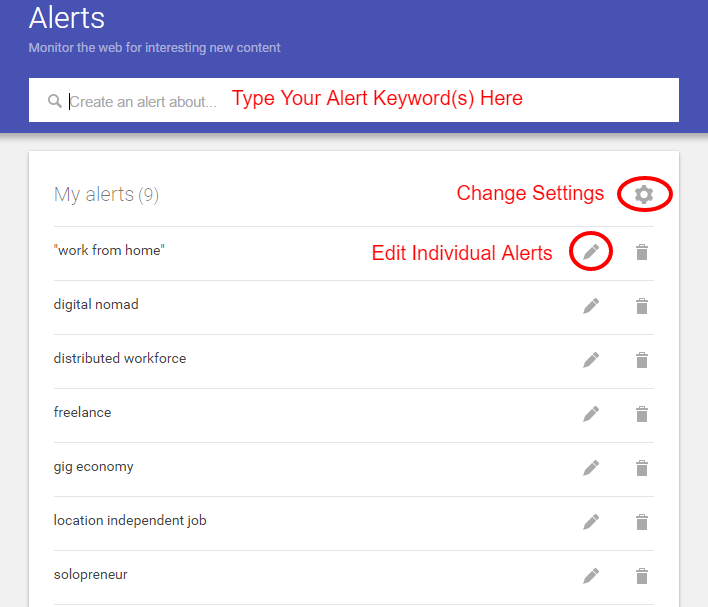 You can create and customize any combination of alerts that work for you. I bet you use Google for all sorts of things. Email. Search. Navigate. Translate. Shop. Really, the list could go on and on. But did you know Google can also help you find a remote job? Thanks to Google Alerts you can have freelance, telecommute, and remote listings sent to your Gmail every day. When LiveOps was hiring 5,000 home-based agents, I heard about it from — you guessed it — Google Alerts. And setting up a Google Alert, couldn’t be simpler. You will need a Gmail Account. Don’t have one? Go get one. It’s free. Once you log in to your Gmail account, navigate to the Alerts Page. If you notice on my alerts page (screenshot below), I’ve got different variations of similar keywords (along with topics I keep up on). Why? Because sometimes you can get different results from Work from Home to “Work from Home” (with quotations). There are no limits to the number of alerts you can create. So, go ahead and try quite a few. I think it’s best to set up several different ones to see which are returning the best results for you. If you find ones aren’t performing, no problem, just delete them and keep those you prefer. With more than a decade in existence, there’s no denying the power of LinkedIn when it comes to professional networking. In total, there are about 467 million active LinkedIn users — not too shabby. It’s no wonder so many unemployed or underemployed workers turn to this site to help them map out their next career move. But what if you’re already employed but hoping to transition to a remote-friendly company? LinkedIn can help you with that too! It can be hard to job search while you’re employed. And you certainly don’t want your current employer know you’re dying to escape your cubicle in favor of a more flexible remote arrangement. The Open Candidates feature, lets you privately signal to recruiters on LinkedIn that you’re open to new job opportunities — without your current employer ever knowing about it. After you turn this feature on, you can let recruiters know which kinds of positions you’re open to. This is where you can make it clear that you’re open to remote and work-from-home jobs. That’s it. Now recruiters can come to you, and you don’t have to worry about your current employer catching wind of your escape plan. If you’re not on LinkedIn, I get it. It definitely has a reputation of being, well, stuffy (for lack of a better term). This has turned away a number of millennials and individuals in certain professionals who think there’s no value to them in this professional networking site. If you’re not a LinkedIn member, go ahead and sign up! Otherwise, you’re missing out on connecting with recruiters from some of the best distributed workforces and at-home programs. And since people like working with people they already know, establishing connections on LinkedIn helps give you a leg up on the competition. If you already have an account, do yourself a favor and give it a makeover using these 3 smart moves that attract recruiters to your LinkedIn profile. An office job search is time consuming. A remote job search can be even more trying. Give yourself a break and automate as much of your search as possible. The more you apply, the more you up your chances of getting hired. And, remember, with each application or resume sent, you’re one step closer to realizing your remote working dreams. 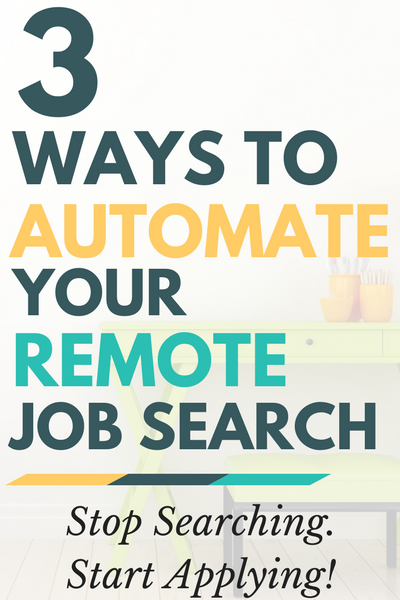 The post 3 Simple Ways to Automate Your Remote Job Search appeared first on Work from Home Happiness.